We are taking a little break from the farm and today flew to St. John’s, Newfoundland, courtesy of our WestJet miles that have been accumulating during the past year of house construction and farm development. We plan to spend four days in and around St. John’s and then four days in the village of Brigus, on Conception Bay. It would be nice to see an iceberg or two but we are a bit late in the season for that and are probably a little early to see whales. But we are looking forward to exploring the geography and history and getting to know a part of Canada which we have never visited before. While we are away the farm and the animals are in the capable hands of Andrew, Colleen and family. 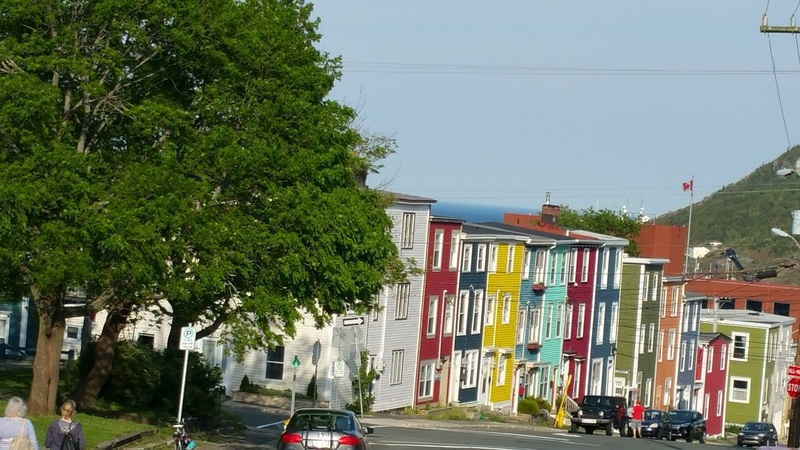 We arrived in St. John’s a few hours ago and have done some walking in the older parts of town. We were interested to see that street after street features brightly painted row houses. On another note, we noticed that yesterday this blog had been in existence for one year. It was June 19, 2015 that we did our first posts, thanks to the help of friend Karen (see The Beauty of the Area and New House Construction). We were also interested to note that just a few days ago the blog passed 10,000 page views. That would have been very hard to imagine when we started last year. It has been enjoyable for us to record our experiences and to have so many people say that they enjoy following. Bob and Sheila: enjoy your time on the Rock! … and don’t forget to watch for seabirds. Congratulations on your one-year blog anniversary and 10,000-views milestone! It’s great to be able to stay in touch in this way. Good to see Burkinshaw Farm is up and running successfully. Do you have a private email or facebook address at which I can make contact.